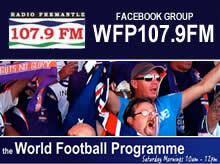 On the show this Saturday, 107.9FM Radio, from 10am, Penelope TannerHoath, Rod Banjac, Dave Kindness and Rose, catch up with this week’s football news. Rose tests our first guest’s football knowledge with her Know Your Football Quiz. Perth Glory owner, Tony Sage, answers some of the questions we are all wanting to know about where to for Perth Glory from here? Jessine Bonzas, Women’s NTC Coach, reviews their fantastic start to the season as Night Series Champions and now sitting atop the Women’s Premier League. Rod Banjac, Forrestfield United Head Coach and Dave Kindness, Murdoch Melville’s President, review the top tiers in local men’s football and how less football registrations in 2018 affects the local game. Michael Dawson, Vice President of Broome Soccer Association, lets us in on why Broome is one of the fastest growing areas of junior football in Australia. Long time show partners….Thank you!